Which central venous catheter (CVC) is best for our patients? Is it the internal jugular (IJ), subclavian, or femoral? We all have our go-to, which I would argue for most, is the ultrasound (US) guided IJ. But is that what is best? Is it recommended by our medical societies? As mentioned, we have a few options for our CVCs. Which of these options is the best overall for our patients and which is recommended? Where does this recommendation come from? They base it on three studies outlined below [Merrer 2001, Goetz 1998, Robinson 1995]. 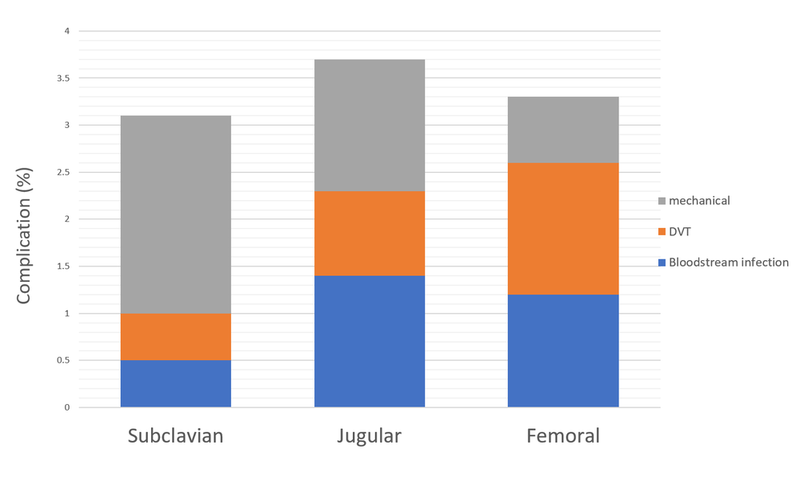 The subclavian line had the lowest overall complication rate at just above 3%. As you can see, the majority of these were mechanical. Wouldn’t it be great if there were a way to decrease the mechanical complication rate to make the graph look like this? The use of ultrasound can achieve this in the right setting and with the correct skill set. This is supported by the literature. The secret to the US-guided subclavian CVC is to look much more laterally than a landmark technique. In the landmark approach we are finding the junction of the middle and medial thirds of the clavicle, then sneaking our needle in under the bone to hit the subclavian vein. In our US-guided approach, we start laterally to identify the axillary vein and find our ideal venipuncture site from there, sometimes even cannulating the axillary vein itself (remember the vessel changes names as it crosses over the 1st rib). The axillary cannulation has the advantage of often being separated from the pleura more than the subclavian. It also has not yet begun to dive under the clavicle (as shown in the following diagrams and accompanying ultrasounds). Reproduced w permission from:American Thoracic Society, Arun Kannappan. Now much of the literature on completing an US guided subclavian line talks about doing it in the longitudinal plane. This is the recommended plane given your ability to see the needle through the single visualized window. This decreases your risk of passing the target and possibly hitting the pleura. If you are more facile with the cross sectional plane by all means go that route. Consider working on your longitudinal plane approach on your peripheral IVs, then transition that approach back to the US guided subclavian CVC if and when you feel ready. And to show you this is not just a handful of people who have this anatomy, here is my own axillary vein becoming the subclavian. It is pretty easy to spot where to cannulate the vein just before the clavicle comes into view. Here is a 10,000 foot view of some of the studies that comment on US guidance for CVC insertion. See the reference list below for all studies.